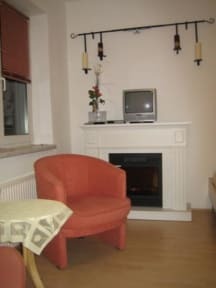 Friedis offers a self-catering apartment for three person in Berlin. This Friedis apartment provides very attractive accommodation with double bed, a single bed and a completely equipped kitchen at your disposal. You will feel at home. Towels and bed linen are provided. If you want to spare your travel budget, here you can serve your food yourself. In immediate surroundings of the apartment you can find three restaurants more differently of national kitchen as well as a pub, a Norma and Edeka supermarket, three bakeries, a butcher, fruit shop and greengrocer and other small shops. The next metro station Wilhelmsruh situated only approx. 300 meters/3 minutes from the apartment. From there you can explore comfortably the variety of the city of Berlin. By metro S1 go all 10 min. (direct connection without having to change) you need 16 min. to Friedrichstrasse, 18 minutes to the station 'unter den Linden'/Brandenburgers gate/Reichstag, the next station is the Potsdam place. kitchen: Dining table with chairs, cooker with range hood, fridge/freezer, dishwasher, microwave, water cooker, coffee/tea maker, dishes, glasses, toaster and other utensils, ironing board and iron. 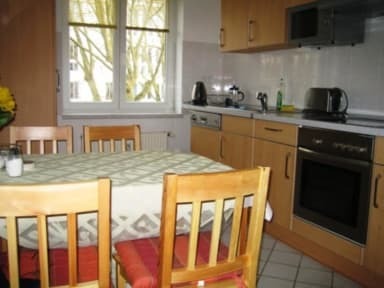 The apartment disposes of one room, kitchen, bath and hall with a total of 36 m .
Parking: Free public parking is possible at a location nearby. The check in at the address of the booked apartment. As we do not have a 24-hour reception we kindly ask that guests sends per e-mail your arrival time at the airport or train station and at which airport or train station you arrive. So we can send you an example of the way and arrange to meet them at the apartment.